View a fly-through video of our new 150,000 square foot operations center. 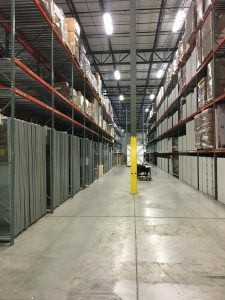 Our new location allows us to consolidate all of our various commercial furniture installation operations under one roof. With 8 separate receiving doors at one end and 16 shipping bays at the opposite end we are able to streamline the work flow and avoid cross-docking product. In addition, we have a drive in ramp to facilitate offloading products that are side loaded (such as glass sheets).